"Anima Mundi", which is the Latin term for "the soul of the universe", is (if it be put simply) a concept or idea formulated to constitute the existence and operation of an intermediary connection or link, between Spirit (or pure Thought) and Matter. 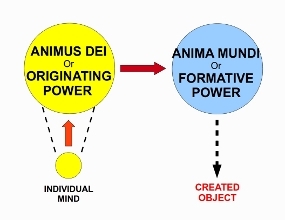 In accordance with the Law of Polarity, which was first mentioned in the discussion on "Universal Mind", Anima Mundi has a corresponding polar opposite, or correlative, in what is referred to as "Animus Dei", which is one of many names to define the so-called "active" side of what may be referred to as the Universal Mind, or All-Originating Spirit. History records that the concept of Anima Mundi had its origin in the philosophy established by Plato, but it has also manifested itself in other philosophies and religions. Notwithstanding its origins and various interpretations, for the purpose of this discourse, the explanation of the concept shall generally conform to that established in Europe during the fourteenth, fifteenth and sixteenth centuries (A.D.). The rationale behind the concept formed may be generally outlined as follows. In general terms, for any sort of work to be done, at least two things are required for the process - namely, an ACTIVE factor (something which does the work) and a PASSIVE factor (something which is worked upon). As can be expected, it is this interaction between the Active factor and the Passive factor, in a particular manner, which produces whatsoever object comes into being out of the work. It is also worth noting that, like many other similar examples to be found in Nature, the Active and Passive factors are not direct opposites to each other, but rather, they are actually complimentary, or polar opposites, and neither can accomplish anything without each other. As was expressed in one instance, the Active factor supplies Selection and Motion, while the Passive factor supplies something from which Selection can be made and to which Motion can be imparted. The ability to supply Selection and Motion implies the existence of Personality, while the absence of such an ability implies what might be called Impersonality. But one would do well to recall from the discussion on "Universal Mind", that the Universal Mind, in and of itself, does not display the attribute of Individual Personality. Rather, it may be said to contain the elements which constitute Personality, and those elements may be considered as subsisting in the Active Factor, or Animus Dei. 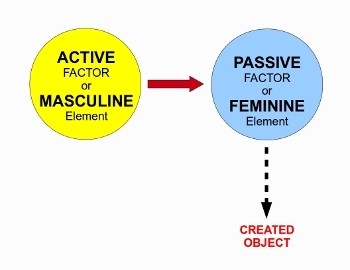 From a historical aspect, those individuals who formulated the concept of the presence and interaction of these two factors often referred to the Active factor as the Masculine element in the combination and the Passive factor as the Feminine element. In addition, the factors were in some instances referred to as the Positive and the Negative factors, respectively - once again, not as direct opposites, but a polar opposites, in similar manner as an electric battery requires both a positive and a negative terminal - once again, an example of the Law of Polarity. The establishment of Polarity is, so-to-say, the driving force that, if left to run its course, will inevitably result in the formation of the particular end-product of the work performed. It is also worth taking note that, both Principles - the Active and the Passive - may be considered as derived from that All-Originating Principle of Life (call it Universal Mind, Spirit, GOD, First Cause, or any other name). In light of this, it is not incorrect to assume the position that the Individual Mind, which itself is an individualization of the Universal Mind, also contains within itself both the Active and Passive factors - only, to a relatively lesser degree than that of Universal Mind. And here it may be noted that, there are essentially only two processes of work by and through which any object can come into being - namely, CREATION and CONSTRUCTION. In a particular sense, they may also be considered polar opposites, i.e., in the end, both are necessary for the ultimate completion of any work. One of many definitions of "Creation" is: the act of bringing into existence something which previously did not exist. 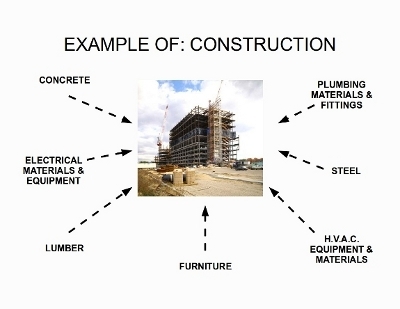 Similarly, one of many definitions of "Construction" is: the arrangement of existing forms or things into a particular combination. If we operate with the definition of the two factors as Masculine and Feminine, we shall see that the object which is the end-product of their interaction, comes into existence by a process of Growth. And, as biology and kindred sciences tell us, Growth is a process which takes place "from the inside to the outside". Conversely, Construction is a purely external process, where one is working on things which already have physical existence. This is possibly the greatest distinction between Creation and Construction, and it would do us all well to grasp the distinction, because, as it will be explained in more detail elsewhere, this may be considered the root cause of many of the problems Man faces - both individually as well as collectively - that there are instances where Man is seeking to accomplish some objective, but he is using the wrong process at some particular moment. Put simply, there is a time and place where the process to be used is Creation, and in like manner, there is a time and place where Construction is to be employed. Now, metaphysics has reached the conclusion that, by virtue of its origin in an infinite and eternal source (Universal Mind or Spirit), the Originating Power (call it Animus Dei, the Active Principle, or any other name) is also infinite or limitless. And a similar conclusion can be drawn to its polar opposite, or the Formative Power, which is Anima Mundi. By "formative", it is meant that it may be likened to the soil, into which a seed is planted, and if that seed is watered and fertilized and left undisturbed thereafter, it will take root and, through the process of growth, produce a plant. In this case, the seed is a Thought or Idea, which is, so-to-say, originated in Animus Dei, and then impressed upon Anima Mundi. 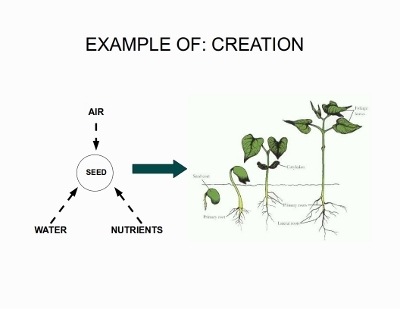 And just like a seed in soil in the physical world, if the Thought or Idea is "watered and fertilized" - the specifics of this shall be addressed in another section - and left undisturbed, it will inevitably lead to the creation of some external fact that corresponds to the Thought or Idea. And the external fact comes into being, through a Creative Process of Growth, which assimilates to itself (literally) everything necessary for the work to proceed to its ultimate conclusion. 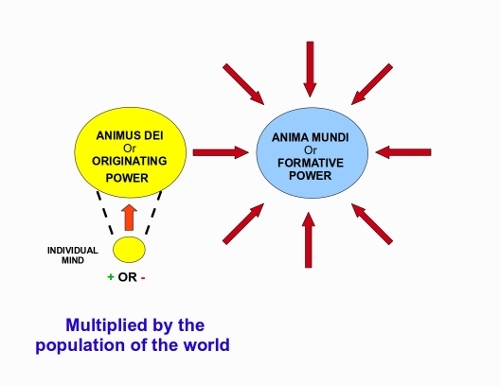 And, it may be put forth that the "seed" (Thought or Idea) may be planted in Anima Mundi, either by the Active Principle (Animus Dei), or by the Individual Mind (which, as stated before, may be considered an "individualization" of Animus Dei), acting, so-to-say, through the Universal Mind. Also, by virtue of Anima Mundi being infinite or limitless, there is (again, literally) no limit to the possibilities and potentialities that are, so-to-say, stored up in it, i.e., whatsoever is properly planted in it and left to gestate must and will "grow" into a corresponding external form. It is also worth emphasizing here - and it will likely be re-emphasized in other sections - that, except in a relative minority of instances, the end-product of the creative process, as outlined by the diagram above, is not necessarily the thing desired to be created. More often than not, the end-product of creation is the formation of one or more conditions, which correspond or match that thing, and it is necessary for the individual who initiated the creative process to subsequently act upon those conditions, in order to ultimately bring the thing into being. As stated above, the action upon conditions amounts to the Constructive Process, while the formation of conditions amounts to the Creative Process. And it must always be kept in mind that - once more, except in a relative minority of instances - both processes are required to be implemented, and at the appropriate time, in order to ultimately bring any desired object into existence. Once the preceding is fully apprehended, the inquirer will likely see, not only the tremendous possibilities that are related to Anima Mundi, but also the potential dangers that are also present. Simply put, because Anima Mundi is "impersonal", it therefore has no intellectual or moral character operating in it, i.e., it makes no attempt to distinguish between a "positive" seed (Thought or Idea) and an "negative" seed - much as, in the physical world, the soil does not distinguish between the seed that produces a weed, or the seed that produces some useful fruit or flower. Moreover, Anima Mundi does not attempt to question or alert the "thinker" as to the quality of "seed" being impressed upon it - either one, if properly impressed upon it, will inevitably lead to a corresponding external fact. And if one also takes cognisance of the established fact that Thinking is a perpetual process, i.e., Man never ever stops Thinking, even if he is not consciously and deliberately forming some Thought or Idea, then it can be amply propositioned that each and every person is, either consciously or unconsciously, impressing some "seed" upon Anima Mundi. Put simply, the overall condition of the entire physical environment in which Man lives and operates right now, can be traced out as the end-result of the cumulative impression of each and every Individual Mind upon Anima Mundi. And an argument can also be put forth that this is not merely limited to those persons who have existence in the physical world - it might even extend to those untold millions of persons who have "departed this mortal coil", for the reason that, by virtue of the Individual Mind being as infinite and eternal as the Universal Mind, even if a person undergoes what might be called physical death, i.e., his or her physical body ceases to function and exist, his or her Mind remains in existence. Accordingly, even these discarnate minds may also be impressing their respective individual states upon Anima Mundi. From basic electrical science, it is an established fact that one can connect a number of (relatively) small batteries to form a (relatively) large "composite" battery. In this composite battery, the total or cumulative electrical output is essentially, the "sum" of the outputs of the individual batteries. And the more individual batteries of the same type that are present, the greater is their contribution to the cumulative output. The analogy also works in the mental or spiritual realm. Even up to the present day, the totality of the human race is impressing their mental state (the totality of their thoughts and ideas) upon Anima Mundi - whether consciously or unconsciously. Simply put, if the majority of the mental states being impressed have a "positive" character, the externalization which inevitably takes place must have a correspondingly "positive" character. And the converse is also true, if the majority of the impressions have an "negative" character. Fortunately, this is not at all to imply that everyone is condemned to live and operate in the same environment as is dictated by the mental impressions of the mass of mankind. In accordance with the principle of the Macrocosm and the Microcosm, each and every human being is actually the creative centre of his or her individual world, and by formulating and maintaining impressions upon Anima Mundi of a "positive" character, he or she can cause the creation of a correspondingly "positive" individual environment for himself or herself, even if others around them appear to be trapped in a hostile, confusing and problematic (i.e., "negative") environment, by virtue of the ignorant employment of their mental powers. It is for this reason that the knowledge of the possibilities and potentialities related to Anima Mundi has, for the most part, been kept secret and guarded (almost jealously) throughout the ages, since it can be appreciated that, the acquisition of this knowledge, without the corresponding development of those enlightened moral qualities that would support its safe and beneficial employment, may be akin to giving a toddler the push-button that would, so-to-say, launch "the Bomb". And it also reinforces the proposition that the purpose of all sound and true instruction in these matters (irrespective of the source of said instruction) is to lead the student to only employ these powers in a safe and beneficial manner, not only to the individual, but even extending to the whole of Creation.